I just heard we had some cancellations so we have a couple of open seats in the Practical Genetic Genealogy course at the Genealogical Research Institute of Pittsburgh (GRIP). The course runs from July 20-25, 2014, in Pittsburgh at LaRoche College. This is the first week-long genetic genealogy course to be offered in the U.S. The course is a mixture of classroom presentations and hands-on exercises. The best way to learn how to use DNA for genealogy is to do it! A registration waitlist link is at http://www.gripitt.org/?page_id=73 or just e-mail info@GRIPitt.org with a subject like "WAITLIST Practical Genetic Genealogy." The course description is at http://www.gripitt.org/?page_id=1147. The GRIP website also has travel information and everything you need to know about the institute and the facilities. A few people told me they wanted to get in, but were too late. Now is your chance. I wish I had e-mail addresses to contact those people directly, but most I met at conferences or society meetings and have no contact information. If you know someone who might be interested please pass this on. The course will be taught by Blaine Bettinger, CeCe Moore, and me. We have divided up the topics so we each teach the sessions we have the most expertise and interest in. We are looking forward to seeing everyone there and know it will be a great group to be part of. The Texas State Library continues its Genealogy After Dark program on 18 July 2014 from 6:00 p.m. to 10:00 p.m. Registration is limited to 30 participants. A link to the registration form is available at: http://www.tsl.texas.gov/genafterdark.html. Registration ends on 11 July (one week before the event). Parking is available in the Capitol Visitors Parking Garage at 1201 San Jacinto. If you have questions, contact the library at reference.desk@tsl.texas.gov or 512-463-5455. The State Library will close at 5:00 p.m. and reopen at 6:00 p.m. for Genealogy After Dark participants. The building will be locked at 6:45 p.m. and no participants will be admitted after that time. 6:00 Sign-in. Reference and Genealogy research rooms open. 6:15 Orientation: Requesting and Using Materials in the Texas State Archives (required for those planning to use archival materials during the event). Archives research room opens immediately after orientation. 7:45 Light refreshments in Lobby. 9:45 Archives research room and microfilm and photocopy rooms close. 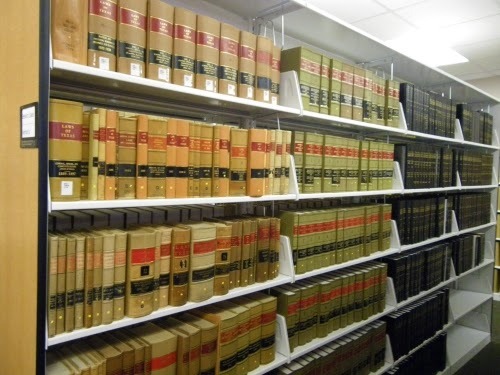 In addition to all of the wonderful original records available in the archives, the library has shelves and shelves of reference books for Texas laws. Prior to the registration of births by the state you may be able to use tax rolls and state laws to determine an ancestor's birth year. What did the law say was the age at which a man first had to pay a poll tax (a head tax,a tax for just being alive and of a certain age, nothing to do with voting)? Find your ancestor's name on the tax roll the first time he pays a poll tax, determine the mandated age when a poll tax was levied, and you can compute a possible birth year for that ancestor. Debbie Parker Wayne, "Texas State Library, Genealogy After Dark, 18 July 2014," Deb's Delvings Blog, posted 24 June 2014 (http://debsdelvings.blogspot.com/ : accessed [date]). 17 June 2014 update: I got a message from Mary Sarah Bilder, Professor of Law, Lee Distinguished Scholar, Boston College Law School, letting me know the correct title of this collection should have used the word Colonies, which I originally added in brackets, instead of Plantations. I made this correction in the post title. Professor Bilder included a link to an interesting article on an appeal related to the Phillips-Woodbridge duel in the June 2014 "Object of the Month" posted at the Massachusetts Historical Society: http://www.masshist.org/object-of-the-month. This background adds to what we can learn in the papers filed for the appeal. Many sources used by historians are also useful to genealogists studying our family history. Are you looking for the name of the wife of Thomas Parker who was in Virginia by April 1699? Have you considered court records in England? Thomas Starke of London appealed a ruling of the court in Virginia to the British Privy Council. Records of that appeal give us the name of Thomas Parker's wife Francillia who is executrix for Joseph Goodricke.1 If this case is from a burned Virginia county this information could be extremely useful to a descendant of Francillia Parker. We'd also be interested in the relationship between Francillia and Goodricke in case this could lead us to her maiden name. Annotations added to the original papers (such as the legal briefs) link to other useful resources. In some cases only the register books have been found; in some cases the register books and the briefs filed for the appeal still exist. Links take you to digital images of the record books. Where the briefs are not available the entries in the record books may not give details of the case, but just state whether the original ruling was upheld or not. Some cases have pages and pages of briefs filed by both sides in the case. The advice to students on how to use these resources will also be helpful to genealogists; definitions of the papers and processes help us understand the British legal system. I can't wait to spend more time in this source. 1. Starke v Parker, Appeals to the Privy Council, Acts of the Privy Council, Colonial Series, Virginia, Report No. 13_1699_00; digital index and images, Ames Foundation, Harvard Law (http://amesfoundation.law.harvard.edu/ColonialAppeals/index_new.php?report_no=13_1699_00 : accessed 16 June 2014). Images from the National Archives, London, England, may be used only for purposes of research, private study, or education; reproduction permission was granted for the Harvard website. Copyright laws in England are different than those in the U.S. Be sure you understand the laws applied to this source before using it. 2. Dan Ernst, "An Annotated Digital Catalogue to Appeals to the Privy Council," Legal History Blog, posted 12 June 2014 (http://legalhistoryblog.blogspot.com/: accessed 16 June 2014). Debbie Parker Wayne, "Digital Catalog for Appeals to the British Privy Council from the American Colonies," Deb's Delvings Blog, posted 16 June 2014, updated 17 June 2014 (http://debsdelvings.blogspot.com/ : accessed [date]). 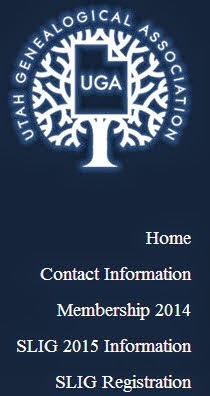 There are still seats open in some of the tracks at the 2015 Salt Lake Institute of Genealogy (SLIG) and some courses have already filled. If the course you want is filled be sure to get on the waiting list as you never know when someone may have to change their plans to attend thereby creating an unexpected opening for you to slip in to! Immerse yourself in a specific genealogical topic for a week-long educational opportunity that is unparalleled. Many of the courses are interactive and highlight on site research at the Family History Library (FHL) as well as one-on-one consultations with the course coordinators and instructors. These individuals are genealogical experts and provide guidance and insight that may help you overcome those brick walls and move forward with your research. Attendees have time to explore Salt Lake City’s many attractions as well as spend time outside of the course researching at the FHL. The library is a short walk from the Institute’s location. When making your travel plans, you may also want to consider attending the Association of Professional Genealogist’s Professional Management Conference (PMC), which will be held the Thursday and Friday before the Institute begins. You can check their website (https://www.apgen.org/conferences/index.html) for more information. You can experience two great events being held back-to-back at one location! Sign-up before October 31st and you will save over 10% off your registration. Become a member of UGA and increase your savings even more. Debbie Parker Wayne, "SLIG 2015 Registration Opens," Deb's Delvings Blog, posted 15 June 2014 (http://debsdelvings.blogspot.com/ : accessed [date]).